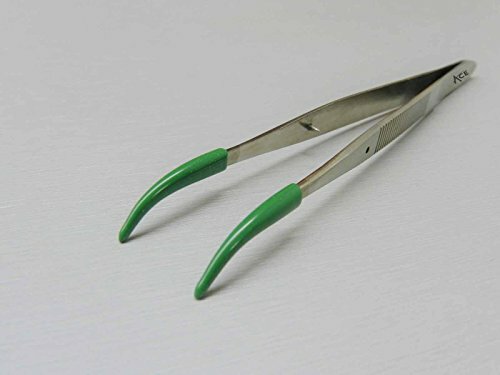 Tweezers with round curved tips, fine tips and rubber coated. These forceps have PVC coated holding tips that provide for a good soft grip without scratching or marring the item. Bent Tip Tweezers have a 45o curved radius angle tips that are particularly handy when picking up Beads and Gemstones, while sorting, especially with smaller and delicate items. Tweezers can be used for various tasks, in many different applications, form Hobby and Crafts, Jewelry and Beads, Quality control and Assembly and in Laboratory work.